Based on new(ish) data on the skeleton of this animal from new material, to be published sometime in the future. Clearly, the new material will completely revamp our perception of what this animal looked like and probably how it behaved as well. 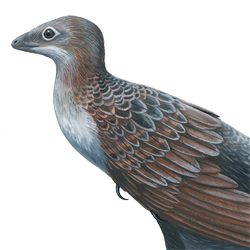 Note the downturned jaw with its procumbent teeth and the much shorter limbs and tail. 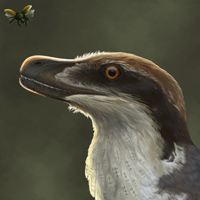 I've heard people say the new material makes Utahraptor "ugly", but I don't see ugly, I just see very, very strange - like an "ostrich bulldog", to use Kirkland's words. Hopefully we'll see the paper out soon. I don't know much detail beyond what you see here, so I'm as excited as the rest of you. And now to let the ecological speculation on what it was actually doing with that weird jaw and extra-short limbs begin! This is not technically a new illustration, but a modification of an old one. To compare it to the prevailing paradigm of Utahraptor anatomy as we've known it for many years, see here.